Zac: Tell me a little bit about yourself. Where are you from and where have you been? Amanda: I grew up in Tampa, Florida and was there until I moved to Los Angeles for college at Southern Cal and my first few working years. I really enjoyed the city, graduated and dabbled in a couple different industries working at a publishing house, a production company, trying to find my niche. Zac: Now you’re back on the East Coast living in DC. How long have you been there? Amanda: I’ve been in DC coming up on a decade now. Zac: What do you do for work? Amanda: Just this year I have moved into a full-time events job here at CEI. So, party planning these days. Zac: You were a driving force for, and one of the producers of the short film I, Whiskey: The Human Spirit. How did you get involved with the I, Whiskey project? Amanda: So, I got involved on the back end of the first video in the series [I, Pencil]. It was another one of my coworkers that had the idea to make a short film based on the essay. I got involved with the promotions with that film. Taking it on tour and introducing it to classrooms around the country and putting it up on TED-ED. We already considered making the I, Pencil movie into a series when one of our supporters, who was a whiskey lover, suggested that we consider whiskey next. My then boss was a whiskey fanatic, as was I, and we grabbed hold of that great idea and pushed it through. So, it was 2012 when the idea was first talked about and we thought what a ripe opportunity to tell a story about all the brilliant products that we love and that are so popular right now. Zac: I watched I, Whiskey and you know I was very impressed with it. It was nicely done. So what got you into whiskey in the first place? Amanda: I first enjoyed the spirit in college. Maker’s and ginger was my intro into the whiskey world. It wasn’t until I moved to DC that I started exploring it a little more. I was a total novice then and still consider myself a novice, to be frank. There’s just too much to know. But then really ramping up researching whiskey for the film, devouring all the books I could and going to a bunch of distilleries in DC and Virginia, I really fell in love with the whiskey community and it rivals my love of the spirit itself. Zac: What specifically about the whiskey community do you enjoy? Amanda: The community is so open-minded and encouraging to novices. Even all the great experts, there’s such a humility to them. You know you can’t ever try all the whiskies in the world, you can’t know everything. Bill Thomas, the owner of Jack Rose dining saloon, I love that he says, “Whiskey anyway you like it. There’s no wrong way to whiskey.” I found that over and over again. There’s such a warmth in the community. And everybody just wants to share the latest thing they’ve discovered or learned. Zac: What challenges did you face in helping I, Whiskey come to the world? Amanda: I was relatively new to the film community. We had big dreams when we launched this project. As a non-profit we had to rely on others’ support for our work. So we decided the scope of the project was going to be based on how much money we could raise and we were dreaming big that maybe we could make an hour-long documentary. But obviously that was one of the hurdles, we didn’t surmount the barrier for that. Then there was narrowing it down. There’s a million different ways you can tell a story of whiskey and who we would feature and finding those people and figuring out how to put the story together within our budget and timeline. Zac: What were some of the rewards of working on the project? Amanda: The whole project was really rewarding. Doing all that research, going to different events, reaching out to people I didn’t know. Everyone’s willingness to participate grew this really great network in the end. Zac: Do you have any future whiskey goals? Zac: What whiskey style does your palate lean towards? Amanda: I think my everyday favorite is an easy drinking bourbon. I used to love rye and I used to not be able to stand Scotch actually but it was with the repeated instruction by my former boss that I learned to appreciate some of the peat, not the peatiest, not the Octomore. A nice subtle peatyness I can stand but bourbon is my go-to. Zac: What advice would you give new whiskey drinkers? Amanda: To give it several chances. A lot of people are turned off after one sip. They don’t like it and think that is their pallet. And that’s fine if they’re not a whiskey drinker, but sometimes it takes a little while to learn to appreciate the spirit. Zac: If you had to pick your top three best value whiskies, what would they be? Amanda: I just have one and it is my everyday whiskey, it’s Four Roses Yellow label. Zac: If I was visiting DC, what whiskey bar would you recommend? Amanda: The must-visit whiskey bar in DC is Jack Rose Dining Saloon. A whiskey library with 2,600+ bottles (the largest collection in the Western Hemisphere) including the Scotch Malt Whiskey Society collection, bottles from their own private barrels, and even pre-Prohibition bottles. Zac: Amanda, thank you so much for talking with me today. From all of us in the whiskey community, thank you for your contributions to our world of whiskey. 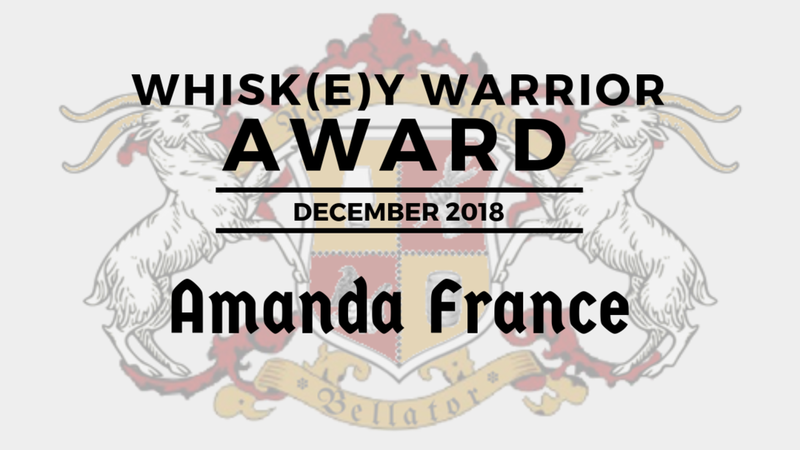 If you’d like to connect with Amanda, you can find her on Instagram @amandanicolefrance, on the I, Whiskey twitter account @iwhiskeyspirit, and on Facebook here. And if you’d like to watch I, Whiskey you can do that here. Remember to nominate your favorite Whisk(e)y Warriors by clicking here. The next award will be released January 1st. We’ll see you then.